Database Systems Corp. (DSC) is a recognized leader in providing state of the art call center software and system development. DSC provides state-of-the-art phone systems and outsourcing services. These include message broadcasting services that are ideally suited for delivering service call reminders. Employing our own voice broadcast systems, our centers can deliver hundreds or thousands of phone reminders in just minutes! Pre-recorded messages can be delivered to either answering machines or to individuals reminding them of warranty service notices, time for an oil change on the car, periodic cleaning services, etc. Simple to complex phone scripts can be developed allowing reminder recipients to make selections using a touchphone response. Calls can be directed to service representatives and schedulers that are standing by or can be transferred to outside third parties. 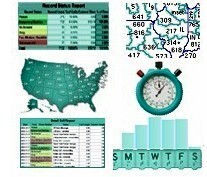 Personalized information from your custom database (such as name, type of service, warranty dates, etc.) can be included in these automatic service reminders. In some reminder campaigns, different messages can be played based upon contact with an answering machine or a person and based upon the time of day. Contact DSC to learn more about our service reminder calls. DSC can deliver several different types of service calls ranging from simple reminders to "Press Through" calls that allow your clients to talk with a service scheduling agent. Here are a few examples of these types of calls. Service Call Reminder - This is a basic service reminder call where the phone system dials from a list and plays one standard message either to an individual or to an answering machine. No one is required to talk with the contacted party who in turn simply listens to the message. This technique could be useful when you wish to simply provide a reminder and provide a phone number for the call recipient to contact you and schedule service. Custom Service Reminder Calls - This is similar to the Service Call Reminder but the phone system plays a customized message based upon the number dialed. Unique items of information can be inserted into a standard message. Likewise the entire message could be unique for each number or based upon demographic items in the call list database. The message itself could be stored in the database. This technique could be useful when you wish to provide custom reminders with names, types of service, and dates included in the message. Service Call Reminder with Touchphone Responses - This method expands the prior call technique by playing a message that gives the contacted individual options from which to select. Using touchphone responses such as "Press 1 for...", the choices could include obtaining additional information, leaving a voice message, scheduling a service appointment, or terminating the call. A different message can be left on an answering machine or the answering machine could be ignored completely. Although more complex than the prior call types, this form of message dialing does not require that a service representative be available to handle this call. Service Reminder with Call Transfers - This is similar to the prior call technique but with the option to transfer the call to one of your service representatives to schedule an appointment. Again, using touchphone responses the contacted individual can request that the call be transferred to your office or another organization. The phone system dials another number and when contact is made with the third party or different phone system, the call is transferred. This is effective when the transfer party or organization is remote such as a doctor's office. "Smart" Service Call Reminders - This type of calling campaign blends service call reminders with predictive dialing and can produce very productive results. Messages are played to the called individual, and if the person wishes to speak with one of your service agents, the call can be routed immediately to your business or office. This type of call works well when your organization wants to provide individual assistance during the service call reminder process. An important feature of our reminder service is the ability to produce real time reports and graphs. This online reporting system helps you observe and control the performance of your phone reminder service campaign with clear and meaningful displays. Voice broadcasting graphs and charts of operational statistics let you measure the effectiveness of each call reminder campaign as it is running. Contact DSC for a FREE analysis and quote and to learn more about our phone reminder services.